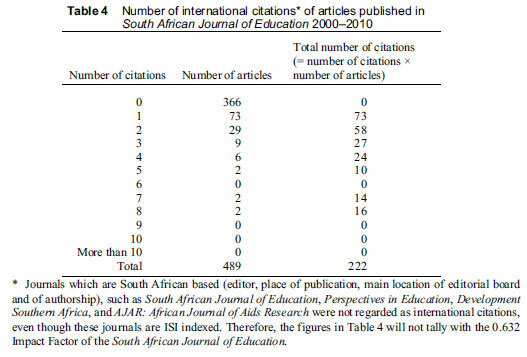 The aim of this article was to determine the international impact of Education research in South Africa, through a citation analysis of articles published in the South African Journal of Education from 2000 to 2010 The citation impact (nationally as well as internationally) was found to be low. The international impact has been particularly poor, both quantitatively (in terms of the number of citations) and qualitatively (in terms of the standing of the publications in which this research does get cited, seen in the context of the hierarchy of scholarly publications). The article shows that certain topics of research in South Africa fail to break through to the international arena at all, such as research on the current restructuring of education in South Africa. Research that was cited most often in international journals dealt with research methodology, creativity and entrepreneurship education, beliefs and perception studies, and language-in-education in South Africa. In conclusion, a number of recommendations are made for raising the international profile of Education research that is done in South Africa and for further research in pursuance of that objective. Internationalisation has always figured strongly in universities and in scholarship, and at the onset of the 21st century the imperative for internationalisation is getting ever stronger. Jane Knight (as cited by Welch, 2002:434) offers the following definition of the internationalisation of education: "Internationalisation is a process of integrating an international, intercultural dimension into the teaching, research and service functions of higher education." Knight (1996) also offers political, economic, academic and cultural arguments for the internationalisation of higher education in an age of competitive globalisation. Internationalisation could also be linked to the more altruistic motives of international cooperation and international dimensions of the common good (Jones, 1999:14), while a number of intellectual and scientific considerations may be added as well, as internationalisation brings about essential academic crossfertilisation. In the absence of international interaction,epistemological, content-wiseand other assumptions are unlikely to be continuously and rigorously re-examined (Welch et al., 2004:318-319). Academic parochialism (a low international impact could be indicative of academic parochialism) can therefore have very destructive results for the scholarly enterprise in the long run. One of the criteria of scientific knowledge and one of the final steps in the scholarly production of new knowledge, is that it should be incorporated into the existing corpus of scientific knowledge. The researcher therefore aims at reaching the maximum readership for his/her research. What makes the issue of the internationalisation of scholarship especially compelling in the case of South Africa, is the country's distance from the heartland of international scholarship (North America and Western Europe) (Welch et al., 2004:319; Altbach et al., 2009:32). Also, the relatively low levels of funding available for higher education in South Africa hamper internationalisation (cf. Neal-Schutte & Fourie, 2006; Wolhuter et al., 2010:208-209). For these reasons, it would be a meaningful exercise to determine to what extent Education research in South Africa registers on the international scale. The aim of this article is to assess the international impact of articles published in the South African Journal of Education (as the prime publication forum of Education research that is done in South Africa) during the period 2000-2010. The article commences with a survey of relevant literature, followed by an explanation of the research method. The findings are then presented and discussed and, finally, recommendations are made for raising the international profile of local Education research. The purpose of this survey is, firstly, to provide the contextual background for the use of the Thomson-Reuters Impact Factor as an index of the impact of South African Education research. The second objective of the literature survey is to survey international scholarly literature to determine what impact research done in South Africa has on international publications, with particular reference to research done in the field of the Education sciences in South Africa. Journals accredited and indexed by the company Thomson Scientific, formerly the Institute for Scientific Information (ISI), are considered the top scholarly journals in the world. Currently there are some 8,500 ISI-indexed journals. The annual Thomson Reuters Impact Factor for each journal provides a quantitative tool for ranking journals: the Impact Factor of a journal is calculated by dividing the number of current year citations in all journals in the ISI pool by the source items (number of articles) published in that specific journal during the preceding two years (Garfield, 1994). In the field of Education, 192 journals are ISI indexed. 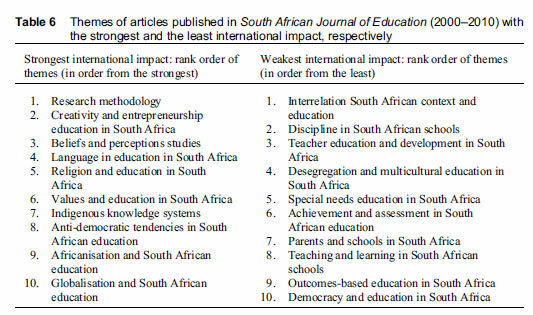 Amongst these, three are South African based: South African Journal of Education (indexed since 1 January 2006; Impact Factor = 0.632), Perspectives in Education, and Education as Change. 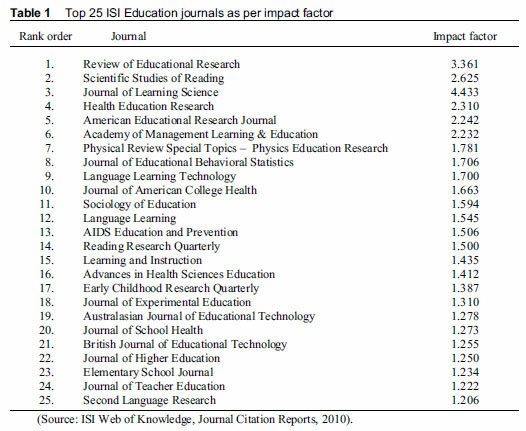 The top 25% of these 192 journals, along with their Impact Factors, are presented in Table 1. The total body of Education research produced in South Africa is quite voluminous; moreover, the rate of production is increasing. Surveying journal articles, conference papers and proceedings, research reports and book chapters produced in Education in South Africa over a twelve-year period (1995-2006), Deacon et al. (2009) could build a database of 10,315 texts. (Master's dissertations and doctoral theses were excluded from these data, as they form a separate project.) Deacon et al. (2010:2) found that the average per annum research outputs of 1995 had almost doubled by 2006. The biggest point of criticism that Deacon et al. (2009:14) have against the corpus of Education research done in South Africa from 1995 to 2006, is the preponderance of small-scale research, with the result that there is an absence of sustained long-term and in-depth research projects. Large-scale, in-depth projects typically render material that has sufficient academic stature to be of significance for the international scientific arena; but because South Africa largely fails to produce this kind of research in the field of Education, the international visibility of South African based Education research is low. Notwithstanding this prevalence of small-scale studies, over a quarter (28%) of South African Education research in the form of journal articles is directly reaching a global readership in that they are published in a foreign journal (Deacon et al., 2010:2). A number of citation analyses on samples of monographs, journal articles and book chapters published in South Africa have been done in recent years. It should be borne in mind that these analyses included citations within South Africa, with the result that international impact cannot be deduced from these figures. The Academy of Science of South Africa (ASSAF) (2009:134) performed a Google Scholar citation analysis of the 389 monographs submitted to the Department of Education for subsidy purposes from 2001 to 2005 - these monographs were from all disciplines, and not only from Education. The average number of citations for all the monographs was found to be 8.47, while it was 11.73 for monographs published by a foreign publisher and 4.65 for those published by a South African publisher (ASSAF, 2009:143). Similarly, as part of an investigation into research publishing in South Africa, ASSAF (2006) performed two analyses. Firstly, an analysis was carried out on the number of South African publications (i.e. articles where at least one author gave a South African address) captured in the ISI database per scientific discipline for the period 1981 to 2004. For Education, the number of publications were as follows: 25 for the period 1981 to 1985; 74 for the period 1990 to 1994; 119 for the period 1995 to 1999 and 151 for the period 2000 to 2004 (ASSAF, 2006:11). Secondly, a citation impact analysis of these articles was done: the citation analysis entailed the calculation of two indices. For each discipline, the absolute impact (i.e. the average number of citations every publication had in the pool of ISI journals) and the impact relative to the world (defined as the citation impact for the country's discipline divided by the citation impact of the world aggregate for that discipline) were calculated. The results for Education are presented in Table 2. In reading the figures in Table 1, it should be kept in mind that at the time of the research (up to 2004), neither the South African Journal of Education nor anyother South African based Education journal was ISI accredited. Hence, the fairly impressive figures in Table 2 all refer to articles which had their launch pad in foreign journals and not in South African based journals. Tijssen et al. (2006) did an analysis of the citation impact of 253 South African journals for the period 1994 to 2002 and came to the conclusion that the vast majority of local journals are virtually invisible on the international circuit. 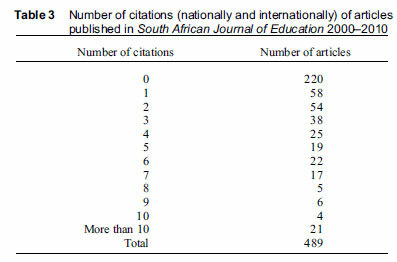 Furthermore, no Education journal appears in their list of the 20 South African journals with the most international citations (Tijssen et al., 2006:171). As far as could be determined, no research has yet been done on the international impact of Education research that is done in South Africa and published in South African journals. A citation analysis was performed for all articles which appeared in the South African Journal of Education for the period January 2000 to December 2010. The impact of each article was determined using ISI Web of Science and Google Scholar.  What were the citation impacts (both nationally and internationally) of articles?  When did these international impacts occur? (trends over time regarding international citation).  Where did these international impacts occur? (publications in which the research was cited).  Which articles were cited and which were not? A total of 506 articles were published in the South African Journal of Education from 2000 to 2010. Of these, 17 had a foreign authorship and were therefore excluded from this study. The overall and international citation impacts of the 489 articles reporting research done by South African authors are presented in Tables 3 and 4. Of the 489 articles, 220 had no citations nationally or internationally, 58 articles were cited once each, 54 twice each, 38 thrice each, and 21 more than 10 times each. Thus, 41% of articles (186 of the 452 articles) made no international or national impact, as they were not cited. Variations over time from 2000 to 2010 regarding the international citation of articles are presented in Table 5. The international impact increased with time, with the aggregate pattern peaking towards 2010. Of all the articles published in South African Journal of Education from 2000 to 2010, only one international citation was made in 2001. This increased to 22 by 2006 and 63 in 2010. 1. Most international citations appear in book chapters (55 citations), theses (15 citations) and research reports (8 citations). Of the citations in journals (total: 178 citations), most are in non-ISI indexed journals (143 citations); and among those in ISI indexed journals (35 citations), only one citation was in the top 25 journals, in Language Learning. 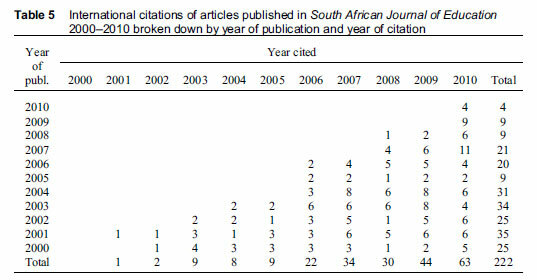 More than one citation of any article published in the South African Journal of Education from 2000 to 2010, could be traced in only four ISI accredited journals: Comparative Education (two citations), English Teaching: practice and critique (three citations), International Journal of Inclusive Education (five citations) and International Journal of Science Education (six citations). Which articles make an international impact ? The 10 themes with the strongest international impact and the 10 with the least international impact are presented in Table 6. Articles on the formative influence of contextual factors (demography, rural location, poverty, etc.) on South Africa, as well as on the societal outcomes (such as economic growth or the eradication of unemployment) of education in South Africa failed to make any international impact. This may be because these articles do not include comparisons with or references to international circumstances - a shortcoming identified in surveys on research on publications on South African education (Wolhuter, 1994) and South African higher education (Wolhuter, 1997) more than a decade ago. However, there is not sufficient recent research to confirm whether or not this is still the case. Articles dealing with the transformation of South African education (curricula, textbooks, desegregations, multicultural education), likewise, do not make any international impact. This may be ascribed to a number of factors. Firstly, the exercise of school desegregation had already run its course in the United States of America and elsewhere. Secondly, key educational reforms such as outcomes-based education had been instituted with the intention to make a political statement rather than to implement best international practice derived from a proper comparative study (cf. De Wet & Wolhuter, 2007). Moreover, this was done in spite of warnings from prominent South African educationists (cf. Jansen, 1999) and acclaimed international commentators, including the "founder" of outcomes-based education (Spady, 2008) that these projects are doomed to failure in the South African context. Articles focusing on multi-cultural education in South Africa could not make an international impact either, possibly because in North America and Western Europe, multiculturalism has been superseded by intercultural education. Only one article dealing with intercultural education appeared in the period in question, but had no international impact. Articles dealing with language-in-education, though, consistently registered an international impact. This may be because the complex language-in-education situation in South Africa offers much noteworthy material for scholars in other parts of the world that also face challenges in this regard: developed countries are becoming increasingly multilingual, and developing countries must accommodate languages that are still in the process of being sufficiently developed as languages of teaching and learning. Articles focusing on religion and education and values in education in South Africa also consistently registered an international impact. This may be as a result of increased international interest in the relation between religion and education, in the aftermath of the events of 9/11. Articles on democracy in education (such as articles dealing with Educational Law or with discipline in South African schools) failed to break through to the international arena, whereas articles dealing with undemocratic tendencies in South African education gained international visibility without exception. The tendencies regarding Educational Law might be explained in view of the fact that South Africa has a prolific professional society of Educational Law scholars (SAELA - South African Educational Law Association) that frequently invites eminent international Education Law scholars to South Africa for conferences and guest professorships. The South African scholars in question then usually co-publish with the distinguished international guest in international journals on Education Law, thusbypassingSouth African journals. Articles dealing with indigenous knowledge systems; research methodology; Africanisation; and perceptions of learners, educators and student teachers were successful in making an international impact. This may be related to the recent interest in indigenous knowledge systems worldwide, in response to the long-standing criticism of the dominance of western (i.e. Western European and North American) based and produced knowledge. This tendency is visible in, for example, the establishment of a special interest group on indigenous knowledge in the USA based CIES (Comparative and International Education Society). Education research that is published in South Africa, and particularly in the South African Journal of Education, has a low citation impact, nationally as well as internationally. It appears that authors work in relative isolation rather than as part of an integrated network of scholars. Although there has been a marked improvement in recent years, their international impact is still very low, both quantitatively (in terms of the number of citations) and qualitatively (in terms of the standing of the publications where they get cited). This shortcoming should be added to the list of shortfalls in Education scholarship in South Africa identified in the seminal study on Education research in South Africa by Deacon et al. (2009). Many prominent themes researched by scholars of Education in South Africa fail to be noticed in the international arena: these include research on the transformation of education in South Africa; democracy and education in South Africa; issues of Education Law in South Africa; and articles dealing with diversity in South African education - with the exception of articles on language, religion and values. The possible reasons why articles dealing with these topics go largely unnoticed were explained above. It was also pointed out that the current reconstruction of education in South Africa is not noteworthy to the rest of the world (cf. Wolhuter, 2011). It is important that individual scholars as well as the national scholarly community in South Africa take note of these tendencies, because to linger on in isolation would constitute a scholarly cul de sac for them.  comparative studies, comparing the focus points in international Education scholarship with those of South African Education research, in order to align the latter better with the former. The only existing published research on such comparisons is by now quite dated (Wolhuter, 1994, 1997, comparing the South African and the international research agenda in the fields of, respectively, comparative education and higher education). However, both these studies show how seriously out of step South Africa was with the international world, at least in the 1990s. Both came to the conclusion that while contextual imperatives should in the first place determine the national research agenda, international developments need to be taken into consideration - although without in any way jeopardising the relevance of research in South Africa. Taking into consideration international developments should not jeopardise relevance, as both the cited publications (Wolhuter, 1994, 1997) found the intersect between the two to be very large - in fact, these publications found that the issues enjoying prominence in research abroad are strikingly visible on the South African education scene too. In view of the findings of this article, a replication of these two studies, and also in other fields of Educational scholarship, would be timely and valuable.  research analysing whether the recent increases in South African Journal of Education impact factors have in fact been matched by improvements in local education research.  Another obvious way to address the problem of isolation, to promote scholarly networking and to tap into the international discourse of educational issues of the day would be for South African scholars to the make the most of their attendance of international Education conferences. This will give them the opportunity to meet and have personal discussions with leading international scholars in their fields, to bring their research to the attention of the international scholarly community, to plan international collaborative research, and to become acquainted with the international research agenda. Empirical research (Wolhuter & Higgs, 2004:267-268) has shown that despite the general low levels of internationalisation of South African universities, South African academics compared well to their counterparts, even in affluent countries, among others because they travel frequently abroad as part of their scholarly pursuits (attending conferences, sabbaticals abroad, conducting research abroad). These opportunities should be used to raise the international impact of their research output.  One especially promising development in the line of Education societies and conferences, is the immanent World Education Research Association (WERA). South African Education researchers could do well by capitalising on the opportunities of networking which this world-wide integrated body of scholars of Education will offer.  Not only should attention be paid to issues in focus in Education research abroad, but South African researchers should also attune their research to paradigm shifts and discourse formations in Education scholarship internationally. However, this should in no way be read as advocating a slavish or uncritical submission to paradigms in vogue abroad. One example would suffice: in research on diversity and education, South African scholarship still largely persists in following the multicultural paradigm, almost as though that paradigm represents the zenith of the international scholarly discourse on the handling of diversity (cf. Meier et al., 2007). Yet, internationally, multicultural education has - for sound reasons - fallen into disfavour and has been discredited at least as far back as the 1985 Swann Report on addressing diversity in schools in England (Great Britain, 1985:418-420). It has since been superseded by a series of paradigms such as Swann's Education for All (Great Britain, 1985:418-420); anti-racist education; and recently by the paradigm of intercultural education (cf. Grant & Brueck, 2011; see also the journal Policy Futures in Education's most recent special issue on the European Council's White Paper on Intercultural Dialogue, 2011).. It is interesting that neither of the two articles under the topic of multicultural education published in the South African Journal of Education from 2000 to 2010 made any international impact, but that the single article under the topic of intercultural education (Meier, 2007) did register an international impact.  As mentioned, 28% of Education research that is done in South Africa and published in journals, was published in international journals. It would be interesting to determine whether this research, with its launch pad in the international circuit, had a larger international impact than research published in South African journals.  It would also be valuable to do research to investigate how international literature and scholars are presenting South African educational issues, in order to identifyopportunities to link with the international scholarly discourse.  Finally, a valuable follow-up study would be to map the citations of international (foreign) scholars by South African authors, as well as the subsequent mapping of the web of citations of these scholars cited by South African authors. Such analyses do not only have the potential to show the identity of South African Education studies and inadequacies in that regard (much as has been done by Schriewer and Keiner's (1992) analysis and comparison of citations of German and French Education publications), but it will also make it possible to construct scholarly sociograms which will clearly show where the best opportunities exist for South African scholarship to link with the international academic circuit. ASSAF (Academy of Science of South Africa) 2006. Report on a Strategic Approach to Research Publishing in South Africa. Pretoria; Academy of Science of South Africa. [www.assaf.co.za] [ Links ] [Date of Access: 15 October 2010]. ASSAF (Academy of Science of South Africa) 2009. Scholarly Books: their production, use and evaluation in South Africa today. Pretoria; Academy of Science of South Africa. [www.assaf.co.za] [ Links ] [Date of Access: 18 October 2010]. Policy Futures in Education (journal) 2011. Special Issue 9(1) on the European Council's White Paper on Intercultural Dialogue [http://www.wwwords.co.uk/pfie/content/pdfs/9/issue9_1.asp] [ Links ] [Date of Access: 12 March 2011]. C C (Charl) Wolhuter is Professor in the Department of Comparative Education at North-West University, Potchefstroom Campus. He has lectured in History of Education and Comparative Education at several universities and has published widely in these fields.